Benjamin Elbel runs elbel libro bookbinding, a London-based business offering bookbinding services, stationery products and products for bookbinders. 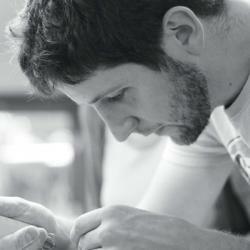 Benjamin is a busy bookbinding instructor in the UK, Europe (also Holland at Boekbinderij Wilgenkamp) and the USA. Some subjects are also available as online workshops and printed tutorials.